Surf Lodge - Wild Coast - Glengariff Accommodation. Casa Surf Lodge – Wild Coast is located on the beautiful east coast resorts, 25 km outside of East London. (A part of the Jikeleza Route - Wild Coast) Wildlife, adventure & leisure activities, as well as excellent fishing & surfing are on your doorstep. Whale & dolphin sightings are common and can be enjoyed from the comfort of your holiday home. You can have it all in the malaria free Wild Coast; magnificent swimming and surfing beaches, (Queensberry Bay, Yellowsands and Glen Eden beaches are all within comfortable walking distance) excellent sea and estuary fishing off the rocks , big 5 game encounters (Inkwenkwezi Private Game Reserve), quad biking, abseiling, mountain biking and sunset river cruises. (Areena Riverside Resort) abundant wildlife, adventure and leisure activities are all on offer within a 15km radius of the house. Casa Surf Lodge is a spacious, family style home with loads of space to relax and enjoy special times together. It is set in a private, secure, sea facing estate with direct access from our forested boardwalk to an excellent surfing and fishing beach. It is a short 2 minute drive or a 10 minute walk to the stunning Glen Eden beach and lagoon. The estate offers a tennis court, a large swimming pool, mini-golf, a children’s play park plus a magnificent boardwalk with seating overlooking the bay. 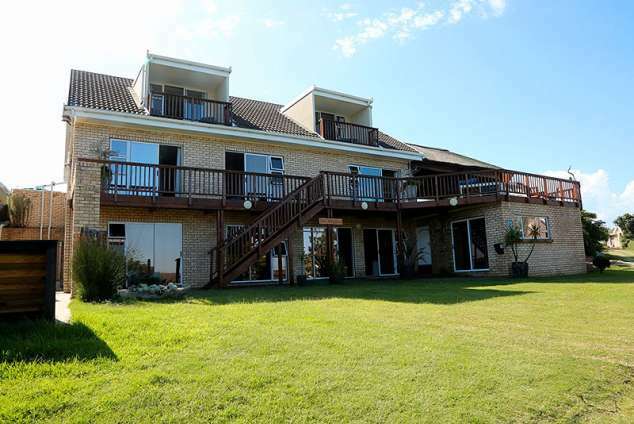 This spacious house has 8 bedrooms of which 6 have sea views displaying awesome Indian Ocean views. A protected, undercover entertainment area offers ocean views with a braai area leading out to a spacious deck with stackaway doors that can be opened up to allow nature in. There is a secluded, private back garden with an outdoor shower( perfect for after those beach visits) as well as a firepit and outside seating area. Satellite TV, wi- console, hi-fi, dvd and wireless Internet as well as a pool table and table tennis are available for those times between beach visits. There is the option to have the house serviced for a fee if required. Our gardener is available to work once a week to ensure all outdoor decks, windows and barbeque areas are clean for your enjoyment. 5381 page views since 17 Apr, 2015.